Although it's packed with vitamins and minerals, pineapple doesn't have any special properties that help you to lose weight. When you eat fresh pineapple, you will get some benefit from its fiber content, which helps to fill you up and control overeating. But most of the fiber is removed from pineapple juice, and what's left is primarily sugar. Even though it's natural fruit sugar, consuming too much will cause you to gain, not lose, weight. You can probably tell from its sweet taste that pineapple juice is rich in sugar. Just 1 cup of the juice provides 25 grams of sugar, which contribute 75 percent of the 132 total calories. A cup of pineapple juice has about the same amount of sugar and 31 more calories than a cup of cola. The only difference is that pineapple juice offers some vitamins and minerals, such as potassium and vitamin C, that cola lacks. Pineapple juice is rich in the two types of simple sugars, glucose and fructose, the latter of which may have specific associations with weight gain. According to research from the Yale School of Medicine, fructose may trigger the desire for food and promote overeating. This is because, unlike glucose, it does not promote feelings of satisfaction and fullness after consumption. Therefore, drinking a lot of pineapple juice, which offers little satiation, combined with the effects of fructose, may cause you to consume excess calories and gain, not lose, weight. Any way you slice it, pineapple is a high-sugar fruit and should be consumed in moderation. You're much better off eating whole fruit than drinking fruit juice. 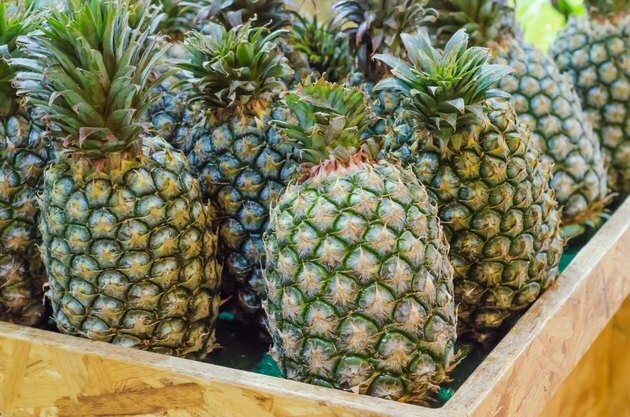 Not only is whole pineapple lower in sugar and calories -- one cup of chunks has 16 grams of sugar and 82 calories -- but it's also a rich source of fiber with 2.3 grams per cup. Stick to a single serving, which is about a 1/2 cup of chunks, and stay hydrated with plain water.